Imbalanced Nutrition: More Than Body Requirements: Intake of nutrients that exceeds metabolic needs. The prevalence of overweight and obesity is now growing worldwide at an alarming rate. These conditions can likely occur if a person’s food intake is greater than what the body can use for energy. It has long been considered to be accounting for significant other health problems, like cardiovascular disease, type 2 diabetes mellitus, sleep disorders, infertility in women, aggravated musculoskeletal problems, and shortened life expectancy. This means that if you are overweight, you may develop these conditions that will put you at high-risk of cardiovascular diseases. You can tell if a person is obese by the size of the waist, the ratio of the waist to the hips, and the relationship between the height and the weight. This measure is known as the Body Mass Index (BMI). It is not the best way of checking the cardiovascular risk but as the BMI increases, so does the risk of heart disease and stroke. If the BMI is greater than 25, it is considered overweight. If the BMI is more than 30, it is obese. African Americans and Hispanic individuals are more likely to be overweight than Caucasians. There are also several factors that affect weight gain including genetics, sedentary lifestyle, emotional factors associated with dysfunctional eating, medical conditions such as diabetes mellitus, severe hypertension, Cushing’s syndrome, and cultural or ethnic influences on eating. Without proper knowledge and intervention, it is likely that this patient population is expected to develop cardiovascular complications and will need substantial resources for future management. The following are the common goals and expected outcomes for Imbalanced Nutrition: More Than Body Requirements. Patient claims ownership for current eating patterns. Patient designs dietary modifications to meet individual long-term goal of weight control, using principles of variety, balance, and moderation. Patient verbalizes accurate information about benefits of weight loss. Patient verbalizes measures necessary to attain beginning weight reduction. Patient states related factors contributing to weight gain. Patient identifies behaviors that remain under his or her control. Patient fulfills desired weight loss in a reasonable period (1 to 2 pounds per week). Patient organizes relevant activities requiring energy expenditure into daily life. Patient uses sound scientific sources to evaluate need for nutritional supplements. Patient demonstrates appropriate selection of meals or menu planning toward the goal of weight reduction. 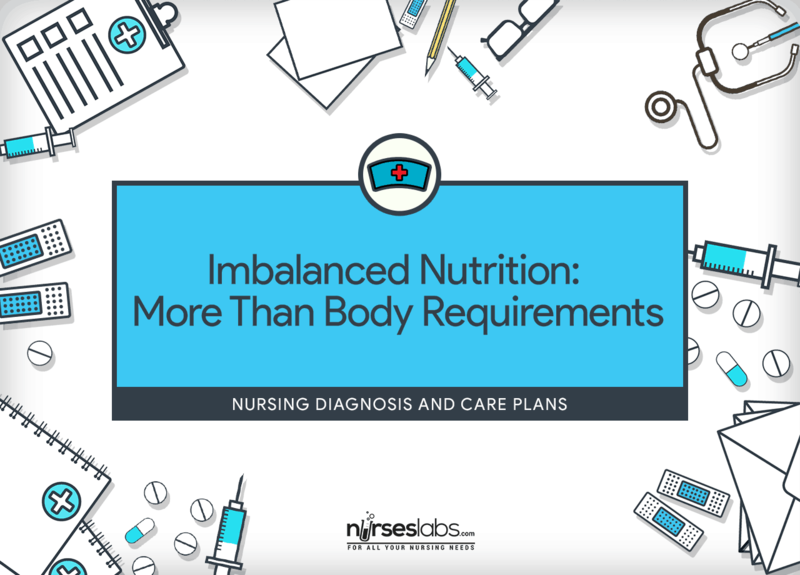 Assessment is needed in order to identify potential problems that may have lead to Imbalanced Nutrition: More Than Body Requirements as well as name any episode that may transpire during nursing care. Note weight, waist circumference, and calculate body mass index (BMI). Exact weight needs to be documented, as patient may have been estimating over time. Men with waist circumference greater than 40 inches and women with greater than 35 inches are at higher risk for obesity-related complications. BMI describes relative weight for height and is significantly associated with total body fat content. BMI is the patient’s weight in kilograms divided by the square of his or her height in meters. A BMI between 20 and 24 is associated with healthier outcomes. BMIs greater than 25 are associated with increased morbidity and mortality. Obtain a thorough history. The most appropriate patients for the nursing intervention of Weight Management are adults with no major health problems who require diet therapy. Evaluate patient’s physiological status in relation to weight control. Nondieting approaches focus on changing disturbed thoughts, emotions, and body image associated with obesity to help obese persons accept themselves and resolve concerns that prevent long-term weight maintenance. Assess the effects or complications of being overweight. Medical complications include cardiovascular and respiratory dysfunction, sleep-disordered breathing, higher incidence of diabetes mellitus, and aggravation of musculoskeletal disorders. Social complications and poor self-esteem may also result from obesity. Know patient’s knowledge of a nutritious diet and need for supplements. This information is helpful in developing an individualized teaching plan based on patient’s current state. Assess dietary intake through 24-hour recall or questions regarding usual intake of food groups. Data may not be fully accurate. Permits appraisal of patient’s knowledge about diet also. How do you feel about starting a weight loss program? Are you ready to choose a time to start changing your eating habits? More specific directions regarding weight loss can be addressed if the patient is in the preparation or action stages. Observe for situations that indicate a nutritional intake of more than body requirements. Such observations help gain a clear picture of the patient’s dietary habits. Environmental factors greatly contribute to obesity than genetics or biological vulnerability. Assessment of current eating patterns provides a baseline for change. Assessment methods may include 24-hour recall and foods eaten, food diaries/records, or food frequency recording using typical food groups. Discover the behavioral factors that contribute to overeating. Overeating may be triggered by environmental cues and behavioral factors unrelated to physiological hunger sensations. Determine patient’s motivation to lose weight, whether for appearance or health benefits. Successful change is more likely to occur if patient has formulated plans for dealing with any barriers. Assess the patient’s ability to read food labels. Food labels contain information necessary in making appropriate selections, but can be misleading. Patients need to understand that “low-fat” or “fat-free” does not mean that a food item is calorie free. In addition, attention should be paid to serving size and the number of servings in the food item. Assess for use of nonprescription diet aids. Clinicians should be aware that apparently harmless herbal remedies may have potent ingredients that are not subjected to the same analysis that the FDA devotes to prescription drugs. Determine the patient’s ability to plan a menu and make appropriate food selections. This information provides the starting point for the educational sessions. Teaching content the patient already knows wastes valuable time and hinders critical learning. Evaluate the patient’s ability to accurately identify appropriate food portions. Serving sizes must be understood to limit intake according to a planned diet. Initiate a patient contract that includes rewarding and reinforcing progressive goal attainment. Patient contracts render a unique chance for patients to learn to analyze their behavior in relationship to the environment and to choose behavioral strategies that will facilitate learning. Set appropriate short-term and long-term goals. Improvement in nutritional status may take a long time. Patient may lose interest in the whole process without short-term goals. Negotiate with the patient regarding the aspects of his or her diet that will need to be modified. Give and take with the patient will lead to culturally harmonious care. Suggest patient to keep a diary of food intake and circumstances surrounding its consumption (methods of preparation, duration of meal, social situation, overall mood, activities accompanying consumption). Self-monitoring helps the patient assess adherence to self-determined performance criteria and progress toward desired goals. Self-monitoring serves an important role in the maintenance of internal standards of behavior. Advise patient to measure food regularly. Measuring food alerts patient to normal portion sizes. Estimating amounts can be extremely inaccurate. Encourage water intake. Water helps in the elimination of byproducts of fat breakdown and helps prevent ketosis. Review patient’s current exercise level. With patient and primary healthcare provider, design a long-term exercise program. Exercise is vital for increased energy expenditure, for maintenance of lean body mass, and as component of a total change in lifestyle. Weigh patient twice a week under the same conditions. It is important to most patients and their progress to have an actual reward that the scale shows. Monitoring twice a week keeps the patient on the program by not allowing him or her to eat out of control for a couple of days and then fast to lose weight. Educate patient about adequate nutritional intake. A total plan permits occasional treats. Permanent lifestyle changes must occur for weight loss to be long lasting. Excluding all treats is not sustainable. During energy restriction, a patient should consume 72 to 80 g of high biological value protein per day to lessen risk of ventricular arrhythmias. Familiarize patient with the following behavior modification techniques: Self-monitoring is the centerpiece of behavioral weight loss intervention programs. In short, self-monitoring is fundamentally linked to successful weight loss. Allow and encourage patient to adopt an exercise routine that involves 45 minutes of exercise five times per week. Moderately intense physical activity for 30 to 45 minutes 5 to 7 days/week can expend the 1500 to 2000 calories/week that appear to be necessary to maintain weight loss. Observe for overuse of particular nutrients. Patients who are consuming excessive amounts of some nutrients may also be consuming less than adequate amounts of others. Provide the patient and family with information regarding the treatment plan options. Because the goal is to obtain a permanent change in weight management, the decision regarding treatment plans should be left up to the patient and family. Guide the patient regarding changes that will make a major impact on health. Even modest weight loss contributes to diabetes and hypertension control. Acquaint the patient and family of the disadvantages of trying to lose weight by dieting alone. With a reduced-calorie diet alone, as much as 25% of the weight lost can be lean body mass rather than fat. Explain the importance of exercise in a weight control program. A physically conditioned person uses more fat for energy at rest and with exercise than a sedentary person does. Teach stress reduction methods as alternatives to eating. The patient needs to substitute healthy for unhealthy behaviors.